I often have the bad habit of skipping breakfast, and every now and then I'll grab myself a pastry at Starbucks as I'm picking up a morning cup of coffee. I like supporting local coffee shops as much as I can, but I have to admit, the SB by the office and by my house has a really good staff and super good customer service, (not to mention some Visionaries fans as well). Whichever coffee shop you do like, I'm sure you love free food. 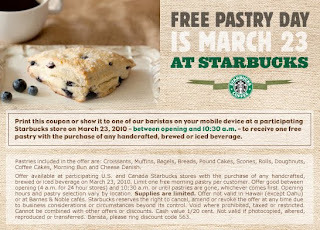 Starbucks is having their Free Pastry day on March 23rd. This means you purchase a handcrafted beverage, you can get a free croissant, muffin, roll, pound cake, bagel, doughnut, coffee cake, morning bun, or cheese danish. I'm not exactly sure what "handcrafted" beverage means, but I'm sure it doesn't mean that your cup has to be carved out of wood, but to be sure, just check their website for the deal details.